Andie Walker’s life is exactly how she wants it. She’s a top notch student with her sights set on Med School, she has the three best friends a girl could hope for and as far as relationships go – nothing serious or longer than three weeks is necessary. Always the planner, she has her perfect summer vacation laid out – attending a highly competitive Summer Medical program that will look amazing on her college applications, finding a summer crush (nothing serious of course), avoiding her dad, and enjoying some downtime with her girlfriends. But when a political scandal involving her Congressman father costs Andie her summer internship she finds herself stuck at home for the summer. Worst of all she’s stuck sharing the house with her dad – whom she hasn’t spent a whole lot of time with over the past five years. With her summer plans completely askew, Andie finds herself doing things she never thought she would - a job as a dog walker? Never would have dreamed of it. Actually enjoying spending time with her dad? Nope, didn’t see that one coming. Cute crush that could actually last longer than three weeks?! You’re kidding right? 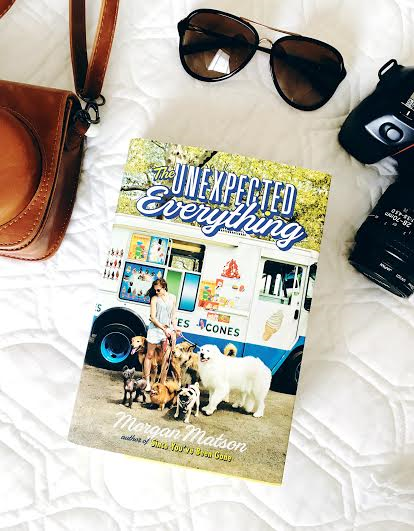 As the summer progresses Andie begins to find that maybe life is less about the perfect plan and more about embracing the unexpected – but can she really stop trying to control everything? Morgan Matson’s book about a teenager who seems to have it all together was entertaining and sweet. Sometimes after you’ve spent quite a bit of time reading darker material you need some light in your book life. This YA novel about a girl and her friends the summer before their senior year in high school was exactly what I needed. Andie and her friends were a relatable group – I enjoyed their group text message chains and the interaction between them, I could see my youngest sister interacting with her friends in the same manner. While tight knit, they weren’t without a little bit of the drama that naturally occurs between friends and I found them overall to be a fun group. One of my favorite character relationships in this book was the one between Andie and her Dad. From the beginning of the novel, the two of them are not close. Andie has been living as she pleases without much, if any, parental supervision – her dad’s near constant attention to his job as a member of Congress taking away from any relationship they may have. As they begin to spend more time together they’re able to work through some of their issues and ultimately start healing some of the hurt they’ve both experienced. But probably one of my favorite things about this book is how Andie matures. She learns to be flexible with life – one of the hardest life lessons to learn especially when you strive to control your surroundings. As the novel progresses Andie find that doing what she actually likes is better than what other people would expect from her. There’s a self-exploration element to the story – which I think young adult readers will like. Plus if you like a little romance with your novels – this one has a really cute romantic relationship too. If you’re looking for a really cute summer read that’s quick and not fantasy – you’ll probably like this. I write YA novels, usually about a girl, a summer, a boy, sometimes a dog, and always lots of coffee and ice cream. I love road trips and traveling, old black & white movies filled with repartee, summers, Starbucks, and fountain diet coke.